This year we are participating in Operation Christmas Child. I learned about this organization at a local homeschool expo back in July. I thought it sounded like an amazing opportunity for our family to help out a child in need. After researching it more and reading some blog posts from my friends over at iHomeschool Network I decided this would be one of the organizations we help out this Christmas. Our family is personally going to try to do 1-2 shoe boxes but I have posted details about Operation Christmas Child on our homeschool group board and hope to get the 80+ families that are part of the group to participate by filling 1-2 boxes. Just imagine how wonderful a child will feel getting a shoe box filled with awesome gifts!!!!! I am writing this post to let you know about this organization so that maybe you too will join in participating. There is plenty of time to purchase several items (check out the clearance sections and dollar sections at your local stores) to place either into a wrapped cardboard or plastic shoe box. I plan on using plastic shoe boxes from Dollar Tree. 3) Fill out the label for the box which can be found here. If your interested in tracking your box to learn more about where it goes make the $7 mailing donation online and print the special barcode label. 4) Include a check for $7 to cover the shipping cost in your box (if you are not making your donation online). You can also include a photo of your family, your address and a note...you never know your kids make make a pen pal. 5) Then drop off your boxes during National collection week which is November 12 -19, 2012. Mark your calendar! You can find out where your closest drop-off point is by searching OCC drop-off locations. That's it...super easy. Don't forget to also get your friends, family, homeschool group, church group, etc involved as well. Read more here or view the video below to learn more about Operation Christmas Child. 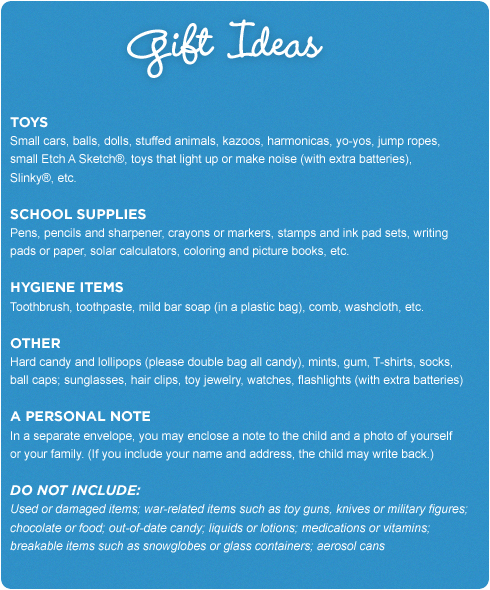 There are many other ways you can get involved as well besides packing shoe boxes. Check with your Regional office to see what other ways you can help. The Georgia Regional office is having a family day on November 17th. Most likely we will be attending this event. The event lasts about 1 hr and families will experience the environment of the processing center and participate in specific activities that will teach them more about Operation Christmas Child.